ww2dbaseThe Enigma machine was a device first commonly used in the 1920s. With a series of mechanical and electrical systems, each keystroke pressed on its keyboard was transformed into a letter using one algorithm, while the subsequent keystroke was derived into another letter with yet another algorithm. 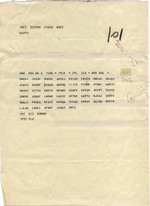 The encryption method was prone to error either by the person entering the message or the one deciphering it, but it also ensured that unauthorized interceptors of the message would take so long to decipher the message that the intelligence would become worthless due to the lapse of time. The Germany military began using Enigma machines starting in the mid- to late-1920s, developing more complex algorithms to increase the security of the encryption. The German Navy was the first to use the Enigma machine. In 1928, the German Army began their version as well. By 1939, the German military and intelligence services each made significant improvements to their encryption algorithms, employing about 100,000 machines across all services. ww2dbaseEnigma code was not perfect, however. British code breaker and professor Dilly Knox claimed to have broken the commercial version of the Enigma machine in the 1920s, and the Polish military had broken the German Army version of the code some time in the mid-1930s. On 25 Jul 1939, the Poles offered the British and the French their understanding of the decryption process. This knowledge sharing allowed the British to quickly setup a decryption effort that eventually came to be known under the code name "ULTRA". The code name signifies that fact that any knowledge of the British understanding of the German encryption code was considered more privileged than the rank of "most secret". With headquarters in Bletchley Park in Milton Keynes, Buckinghamshire, England, United Kingdom about 50 miles north of London, the British cryptographers worked hard to decipher the remaining and more complex versions of the German Enigma code. Very soon, the British cryptographers caught a break: they had come to realize that out of lack of discipline many German messages were sent every day with the exact same encryption, which gave the code breakers a constant flow of messages for them to work with. Had the Germans changed the rotors on their Enigma machines more frequently, the British might not have had enough information to work with to break the code. By late Jan 1940, the ULTRA program was fairly confident that they now possess the power to decrypt most German military codes at that time. This was considered a major turning point in the intelligence realm of the war. ww2dbaseThe British were also very careful on what decrypted information to take advantage of. They concluded that had they jumped on every piece of information they could decipher, the Germans would quickly come to realize that their code had been broken, and would most definitely change their entire code set overnight. Therefore, while ULTRA had provided many pieces of intelligence on the movements of German submarines and other naval vessels, for example, only those that they could come up with a cover story were attacks. Sometimes the cover story involved a lucky scouting plane that came across a surfaced submarine, and sometimes a civilian fishing vessel was the key to a successful British raid on a supply convoy to North Africa. ww2dbaseEven though the German code changed a number of times during the course of the war, such as the code change ordered by German Admiral Karl Dönitz in 1940, the British code breakers working on the foundation set by their Polish forerunners were able to provide valuable information to the Allied cause. By Aug 1943, the Allies were generally breaking Enigma messages with relative ease. ww2dbaseJust as the Allies attempted to break German communications, the Germans attempted the same, and with great success. Talented radioman Wilhelm Tranow had broken British Royal Navy's 5-digit code back in 1935, and in Dec 1941, Beobachtungsdienst (B-Dienst) of the German Department of Naval Intelligence, under the leadership of Tranow, broke British Naval Cypher No. 3. The British had no clue that their code had been broken until a deciphered Enigma messaged revealed that the Germans were changing a particular plan after having intercepted British naval communications; the Royal Navy was not able to communicate securely until Naval Cypher No. 5 was put in use in Jun 1943. In Mar 1943, the US Navy had a similar revelation, realizing that the Germans were reacting very quickly based on orders being sent to ships on the high seas via radio. After the war, Karl Dönitz noted that half of his intelligence during WW2 came from deciphered Allied messages. After 1943, however, German codebreaking efforts generally yielded very little results as Allied encryption methods became more sophisticated. 16 Aug 1939 In France, British General Stewart Menzies received a Polish-built Enigma machine based on the successful Polish attempt to German military codes. The machine was immediately sent, via diplomatic protection, to Britain. 18 Sep 1939 Polish cipher experts fled to Paris, France with vital knowledge of the German Enigma code. 14 Jan 1940 British cryptologists at the Government Code and Cypher School, Bletchley Park deciphered the German Enigma code with help of Polish experts. 17 Jan 1940 Polish cryptographers in Paris, France cracked the German air force's Enigma codes, making it possible to intercept and read all the Luftwaffe's secret transmissions. 12 Feb 1940 British Royal Navy minesweeper HMS Gleaner located German submarine U-33 laying mines in the Firth of Clyde, Scotland at 0250 hours. U-33 was badly damaged by depth charges and surfaced at 0522 hours, but the submarine began to sink shortly after surfacing, killing 25 men, including commanding officer Kapitänleutnant Hans-Wilhelm von Dresky. One of the 17 survivors had 3 Enigma rotors in his pockets, which was sent to Alan Turing at the Government Code and Cypher School for further study. 22 May 1940 Cryptologist in Bletchley Park, England broke the Luftwaffe Enigma code. 2 Sep 1940 In Britain, the Bletchley Park codebreakers with the help of the newly installed Bombe succeed in breaking the "Brown" cipher thereby providing useful information regarding German Luftwaffe targets. 7 May 1941 HMS Somali captured the German weather ship München off Iceland along with an Enigma cypher machine and code book. 9 May 1941 German submarine U-110 and U-201 attacked Allied convoy OB-318, sinking 3 British freighters. U-201 was damaged by 99 depth charges but was able to return to her home port for repairs. U-110 was forced to surface by 10 depth charges from British corvette HMS Aubretia, then shelled by destroyers HMS Bulldog and HMS Broadway. The German crew thought the submarine had already been fatally damaged and sinking, and abandoned ship. Recognizing the opportunity to capture the ship, the commanding officer of HMS Bulldog quickly rescued many of the German crew and put them belowdecks so they could not observe (but submarine commander Lemp died in the water, possibly shot as he attempted to swim back to the submarine), and sent a boarding party to capture her. The capture was completed at 1245 hours, yielding an Enigma cipher machine and code book. 10 May 1941 German submarine U-110, captured by HMS Bulldog on the previous day, sank while being towed toward Iceland. Her Enigma cipher machine and code book, however, had already been retrieved by the British. 19 Jul 1941 Winston Churchill decided to share military intelligence gained by deciphering the German Enigma-encoded messages with the Soviets, but the Soviets would not be told how the intelligence was gained; instead, they were told that the intelligence was gained through a spies in Berlin. 2 Oct 1942 The British codebreaking establishment at Bletchley Park and the US Navy's codebreaking department (OP-20-G) agreed to a relationship of "full collaboration". 13 Dec 1942 The Enigma codebooks captured by HMS Petard from the sinking German submarine U-559 arrived at Bletchley Park's Hut 8 and within one hour intercepts of German submarine signals allowed the British Admiralty to instantly pinpoint the location of fifteen U-Boats. 10 Jun 1943 British Admiralty introduced Naval Cypher No. 5, replacing No. 3 and No. 4, finally ending the German ability to read British naval orders. 25 Nov 1943 Colossus, the world's first all-electric computer, created by Post Office engineer Tommy Flowers, to assist in the reading of German Lorenz teleprinter traffic, was tested at the Post Office factory in Birmingham, England, United Kingdom. The huge machine would be able to process data five times faster than the earlier slower Robinson machine and process as many as fifteen signals a day. 28 Jun 1945 The British Chiefs of Staff drove to Bletchley Park, where Sir Alan Brooke addressed four hundred of its staff, thanking and congratulating them for their extraordinary contribution to the Allied war effort. Enigma code was broken by Polish inteligence in 1939. They even build copy of that machine. i hate this f**king website it is c**ppy s**t.
The ‘New Town’ of Milton Keynes did not exist as such until the late 1960s. However, during the 1940s, there was a small village of that name, near Bletchley, which reportedly can claim existence back to the Norman conquest.